Estimated Delivery Time: Please allow two weeks for delivery when choosing the Standard Shipping method. If you require faster delivery, we suggest choosing the Expedited or Next Day option. 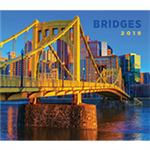 Bridges 2019 is the must-have wall calendar for all bridge lovers. Whether you design, build, cross, or simply admire bridges, you will be dazzled by the majestic display of art and architecture in these photographs. Each month highlights a spectacular bridge, along with a thumbnail history highlighting the bridge's engineering significance. Additionally, each month contains a bonus bridge mini-photo, with a brief history. 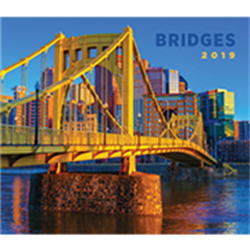 Bridges from across the United States and around the world are on brilliant display in this full-sized annual calendar. Bridges 2019 celebrates the awesome combination of art and architecture that is the cornerstone of great engineering. These civil engineering masterpieces inspire photographers, too! Every photo in the calendar was selected from entries to ASCE's Bridges Photo Contest, and all winning photographers are identified. For questions about using the calendar to promote your organization, please contact ASCE.